You will always know the direction of North, South, East and West when you have a watch... even if you have a digital watch that is missing the traditional clock hands. Always remember to make any changes for Daylight Savings Time, British Summer Time or whatever adjustment has been made to the real time in your area. If you only have a digital watch, draw a circle on the ground or in the sand with the numbers and the clock hands. If you happen to have a pencil and a piece of paper, draw a circle with the numbers and the clock hands. Figure 1 indicates that the time is 9:30 AM. Hold the watch or the piece of paper with the drawn clock horizontal and point the hour hand toward sun (in this case the hour is 9). If you are drawing the clock in the ground, draw the hour hand pointing to the sun. 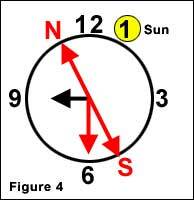 Bisect the angle between the hour hand and 12 o'clock to get the north-south line (red line). Remember that the sun rises in the east and sets in the west (if you can't determine which way is the north-south line). The sun is approximately due south at noon, the sun is in the east before noon and in the sun is in the west after noon. Figure 2 indicates that the time is 9:30 AM and if there is a 1 hour difference between real time and the time of 9:30 AM (daylight savings time of 1 hour). If your watch is not set to real time (set instead for daylight savings time), bisect the angle between 1 o'clock and the hour hand (if there is a difference of 1 hour for daylight savings time) to determine the correct north-south line. Figure 3 indicates that the time is 9:30 AM. 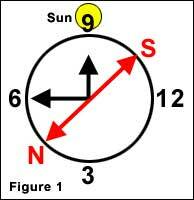 Hold the watch or the piece of paper with the drawn clock horizontal and point the 12 o'clock toward the sun. If you are drawing the clock in the ground, draw the 12 o'clock pointing to the sun. 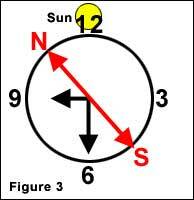 Bisect the angle between the hour hand and 12 o'clock to get the north-south line (red line). Remember that the sun rises in the east and sets in the west (if you can't determine which way is the north-south line). The sun is approximately due south at noon, the sun is in the east before noon and in the sun is in the west after noon. Figure 4 indicates that the time is 9:30 AM and it there is a 1 hour difference between real time and the time of 9:30 AM (daylight savings time of 1 hour). 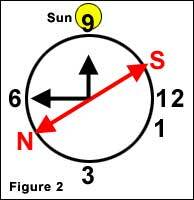 Hold the watch or the piece of paper with the drawn clock horizontal and point the 1 o'clock toward the sun. If your watch is not set to real time (set instead for daylight savings time), bisect the angle between 1 o'clock and the hour hand (if there is a difference of 1 hour for daylight savings time) to determine the correct north-south line. Remember, the further you are from the equator, the more accurate the watch method will be.